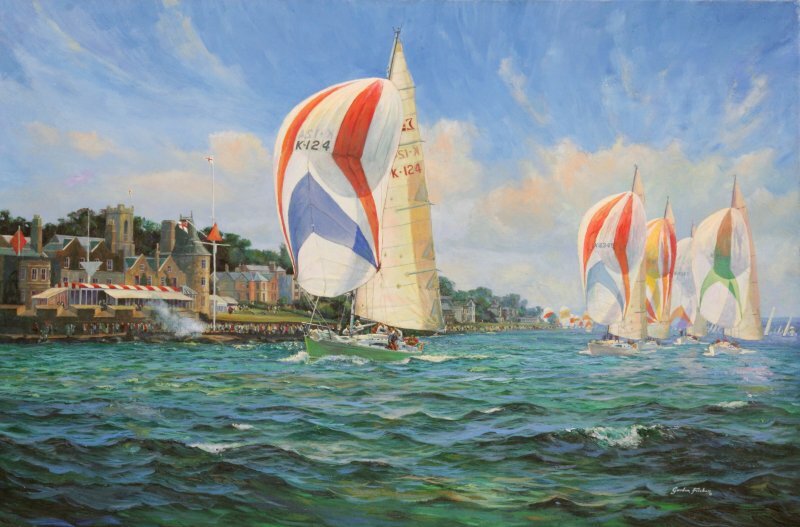 A ‘Royal’ Cowes Week painting by Gordon Frickers 61 x 91 cm (24″ x 36″), oils, available.. I wonder if anyone realises how remarkable this royal painting really is? Despite strict security and a restrictive protocol I got onto the water, unobtrusively near ‘royals’. I was able to witness first hand Prince Philip’s triumph hence we have a very unique and now historic painting here. “Yeoman XXVIII” is shown, Prince Phillip at the helm, passing the Western Esplanade, leading her class, taking the winning gun from the Royal Yacht Squadron. My thanks to one of the ‘old boys’ I found, cultivated’, in a pub on the quay, a Cowes waterman, we shared a few beers. In fact I found all the local West Cowes people very helpful, kind, a good crowd. Prince Phillip has over many years been an enthusiastic supporter & asset to Cowes Week, contributing humour, prestige and importantly, leadership. On one occasion when Phillip had made a mistake rounding a mark, an angry competitor yelled ” Who do you think you are? You don’t own the ruddy place” to which Phillip coolly replied, “no, but my wife does“. A friend of the Aisher family, he sailed their Sigma 38, “Yeoman XXVIII” on quite a few occasions. 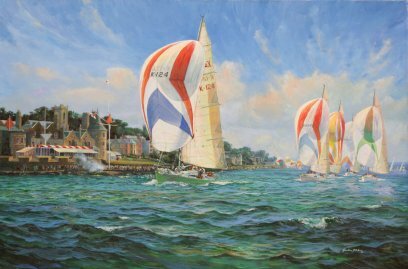 Having watched him in action, I produced this and another painting on speculation, to record a little of the flavour of a typical day from this famous annual regatta. At the request of Prince Phillip this painting was shown at Buckingham Palace. The picture is now looking for a more permanent home so here is your chance! Further Reading: Useful facts + excellent stories about [CF7_get_post_var key='title'].